Your business trip, seasonal break or family vacation can be enhanced with the spacious, comfortable houses, condos and villas at Jacksonville Beach vacation rentals. It's a treat that everyone will remember from their visit to this small seaside community. From single-room to multi-floor residences, Jacksonville Beach vacation rentals can provide for large parties and small, with furnishings and decor tailored for the Florida visitor. With so much to do and see in the area, you'll thank yourself each night when you return to your special digs at Jacksonville Beach vacation rentals. 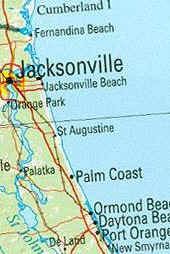 Jacksonville Beach is just East of Jacksonville, the largest city in Florida but you'll not find the problems associated with the big city here though. Its quaint downtown area is walkable and allows for shopping and outside dining. The city's center is marked with City Hall, a public park with beach access, a promenade and pavilion. Concerts at the Seawalk Pavilion entertain the locals as well as visitors regularly and the entire area becomes a giant meeting place. For local touring there are museums, preserves and eco parks along the coast as well as an abundance of water activities because of the Jacksonville Beach location on the Intracoastal waterway and Jacksonville Beach's closeness and access to the Atlantic Ocean. St. Augustine and the Kennedy Space Center are within comfortable driving distances and you can be at the center of it all from Jacksonville Beach vacation rentals.